Jana Park-Okuna of Volcano Joe's is one of the many success stories in a booming job market. 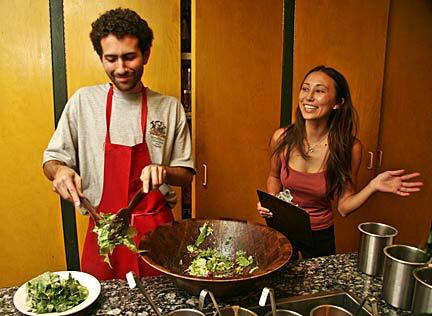 Here, she jokes with Dominick Takis as he makes salad for the lunch crowd. When Jana Park-Okuna returned to Honolulu from Los Angeles in February 2004, she had no trouble finding a good job. At 23, Park-Okuna already had nearly a decade of experience in the restaurant industry, which was booming in Oahu at the time. She turned down two more lucrative offers from franchise restaurants to become assistant general manager of Volcano Joe's, a sandwich, pizza and salad joint on University Avenue. A year later, Park-Okuna has been promoted to general manager of Volcano Joe's, where she is earning about $35,000 a year, plus a share of quarterly profits and an equity stake in the young company. Not bad for a 24-year-old with an associate's degree in American Sign Language interpreting. As Hawaii enjoys an extraordinary economic boom driven largely by construction and real estate development -- and its lowest unemployment rate in 14 years -- stories like Park-Okuna's are hardly unusual, especially in high-demand industries like restaurants, nursing and construction. The question is, How long can it last? And what will happen to workers like Park-Okuna when the boom cools? Paul Brewbaker, chief economist with Bank of Hawaii, does not foresee a big bust any time soon. That's in part because he sees signs of an economy that is surprisingly diverse, driven in part by industries that typically receive scant attention in public discussions about Hawaii's economy. In addition, some industries, such as nursing and health care, are expected to be providing ample opportunities for the next decade. Even the construction industry is expected to enjoy a soft landing in part because of large, long-term military contracts. Still, Brewbaker said, an economy without growth is hardly something to aspire toward. "You take away growth and that's the 1990s in Hawaii," Brewbaker said. "Going sideways is actually not that pleasant. Going sideways means that some guys are growing and others are declining." Last week, the University of Hawaii Economic Research Organization forecast that job growth will slow next year in part because employers face increasing labor costs in this tight labor market. Eventually, some employers, such as builders, will likely say the costs are simply too high to justify doing a certain project, said Byron Gangnes, one of the forecast's authors. This, he said, will lead to a "pattern of a slowing local economy but not a stagnating one." In the offices of the Hawaii Carpenters Union, few are envisioning the prospect of slowing any time soon. Denis "Mac" Mactagone, senior service representative for the union, said all of the union's 5,500 members are working and that newly minted apprentices are being snatched up as quickly as they get trained. The shortage of workers is so acute, in fact, that the union is encouraging carpenters to come from the mainland. "Any way you look at it, it's a good problem," said Jonathan Brown, the union's director of organizing. Brown and Mactagone say there is no end in sight. Even when the current residential boom ends, they say, there will be work for years from Uncle Sam, including a big military housing project at Hickam Air Force Base. Actus Lend Lease LLC, an affiliate of the Australian giant Lend Lease Corp. Ltd., has a 50-year contract to build, renovate and maintain approximately 1,350 homes. The first phase alone is worth $300 million. "This is going to be our longest-lasting surge of work," Mactagone said. "We don't expect anything to slow in the next 10 or 15 years." Brewbaker said he was "inclined to agree," with a caveat. The military work, Brewbaker said, will keep a certain number of workers employed. But that alone will not sustain the growth of recent years. "That becomes part of the flat level that we reach," he said of the military projects. Analysts expect that nurses also will be in short supply well into the future as older nurses retire along with the nursing instructors who are needed to train new ones. Barbara Matthews, director of the nonprofit Hawaii State Center for Nursing, said the group projects there will be a shortage of 2,300 nurses by 2010 and 4,600 by 2020. Already, the shortage is acute. Mark Dawson, director of research and development and technical placement for Altres Staffing, said the situation was so bad that some medical establishments were offering nurses $1,500 to work three extra shifts per week. "If you can't meet (the demand) today and you project forward 10 years, we're probably going to be thousands of medical professionals short," said Dawson, whose company places skilled workers with construction, medical and professional firms on a short- and long-term basis. Data from the U.S. Department of Labor's Bureau of Labor Statistics shows surprising trends. While some professional occupations have declined in the past 15 years as a result of technology, others have grown. In the past 15 years, the Honolulu economy has added nearly 20,000 professional and business services jobs, rising from 41,400 in January 1990 to 59,400 last April. These include skilled occupations, such as lawyers, accountants and payroll administrators. Another broad sector, which the bureau calls "Administrative and Support and Waste Management and Remediation Services," has added 14,800 jobs in the past 15 years, rising from 18,500 in January 1990 to 33,300 last April. These occupations include office administration, clerical occupations, cleaning and trash disposal. 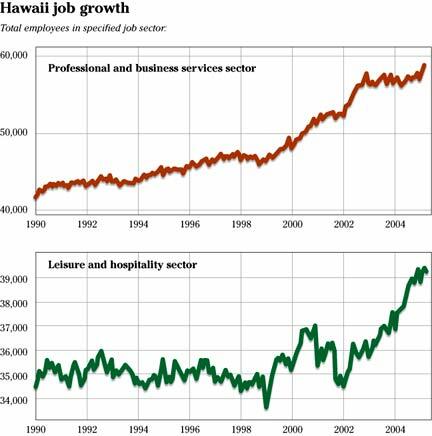 And after falling steadily during the mid-1990s, scientific and technical service jobs have grown to historic highs, amounting to 20,000 jobs for the Honolulu economy. Brewbaker said such numbers show something that is rarely mentioned when people bemoan a lack of diversity in the Honolulu economy. He said he has tried to point this out to policy-makers who routinely debate policies for jump-starting particular sectors. But, Brewbaker said, he has gotten nowhere. "Can we just get over this diversification thing?" he said. "It happens." Volcano Joe's general manager Jana Park-Okuna has a crowded office to work in. She says she spends most of her time here. For Park-Okuna at Volcano Joe's, all of this speculation is insignificant. She feels secure in her job and is in an industry that has added nearly 4,000 jobs since 2002. A natural leader who once directed homespun theatrical performances of "The Little Mermaid" with kids from her neighborhood, Park-Okuna knows that experienced managers like her are hard to find. "It's pretty much impossible for me to hire people directly as managers," she said. "They're just not out there." Her boss, Volcano Joe Owner Les Iczkovitz, said Park-Okuna has a knack for finding and keeping good employees, something that is essential now. Iczkovitz does not see the labor market changing any time soon. "Everywhere you go you see 'Help Wanted' signs," he said. "I think it's just going to become a bigger problem." ... Hawaii's stronger economy is helping many workers to get ahead, but even with higher salaries the cost of living in Hawaii continues to soar. KITV 4 -- Island Television News' Shawn Ching talks with local experts and asks, Are these higher-paying jobs keeping up with the times, or will Hawaii soon see another mass migration to the mainland? Tonight at 10 on Your Island Television News.